Indoor and outdoor recycling is made simple with these identifiable and labeled recycling receptacles. The dome style lid features a rounded disposal opening labeled aluminum, plastic and glass with a materials. 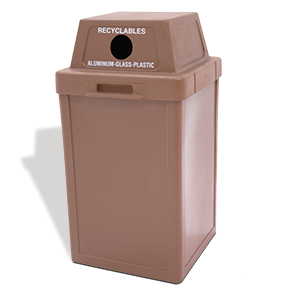 This top tightly seals to a durable 24 gallon square recycled plastic waste container. The entire container and lid is constructed from impact and weather resistant polyethylene that will not rust, stain, chip or dent from high volume use. Available in a variety of standard plastic colors.